The OMB.433.B03F21 is a fiberglass Omni-directional outdoor antenna, operating in the 433 MHz ISM band. The antenna is designed for applications such as metering, industrial / environmental monitoring, remote asset monitoring, and mesh network applications. The OMB.433 operates at 433MHz, one of the most widely used license free ISM bands, with a 3dBi peak gain. The omni-directional antenna radiates uniformly in the azimuth. This collinear design characteristic provides the best performance, giving optimized coverage and therefore longer range in the horizontal plane over 360 degrees, thus minimizing the amount of nodes needed for a mesh network. 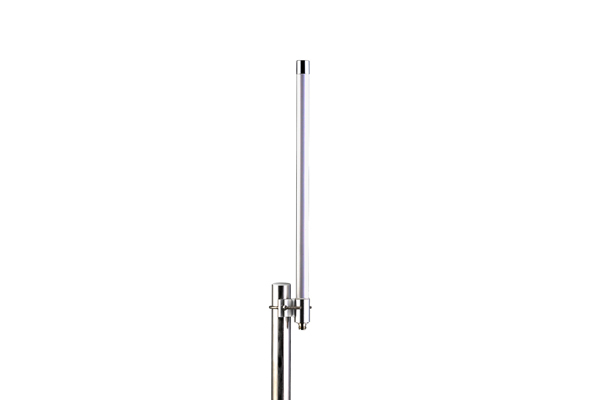 The UV resistant fiberglass housing enables the OMB antenna to be utilized in all kinds of harsh environments, making it more robust and safer than traditional whip antennas. It can be connected directly to the access point or telemetry unit, or can be mounted on wall or device surface via the N-type connector.